Pictured with assistant coach Bob Bratcher and Coach Tim Scheer are New Haven's six graduating seniors: left to right: Victoria Bowers, Stephanie Scheer, Madison Doyle, Blair Bowers, Madison Yarbrough, and Meagan Ley. UPDATE: New Haven ends their season in a 13-10 loss to Wellsville. New Haven, Mo. 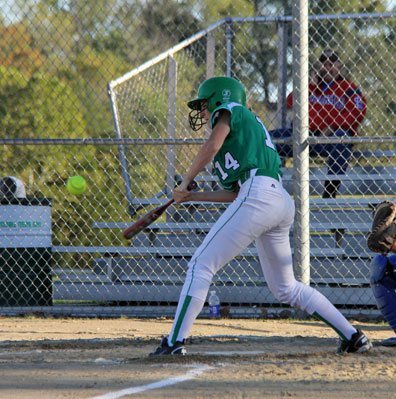 - The Lady Shamrocks will enter tonight's district opener on a roll after winning their last two regular season games, scoring a combined 58 runs with wins over Montgomery County and Bourbon. Monday night New Haven dropped a bomb on Bourbon in a 33-0 win, scoring 25 runs in the second inning alone. 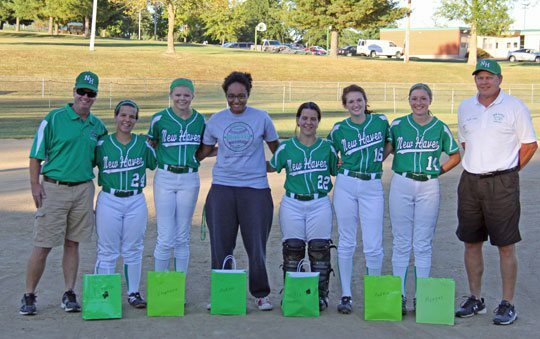 It was also the last time New Haven's six seniors would step onto their home field, playing one last time on the same field where their love for the game began. While New Haven struggled most of the year, headed into districts with an overall record of 5-16, Coach Tim Scheer said, "Every game and every practice I knew they would always give 110%... working to improve... looking back and how much these girls improved from day one is all you can ask for." Lindsey Nixon hits a line drive single in her first at bat Monday night. Four year starter and New Haven's starting pitcher for the past three years, Stephanie Scheer said, "This season was a little rough but I have great people around me and playing with most of the girls all four years, you develop close friendships, which those last forever." Second baseman Meagan Ley, like most seniors, had career numbers this year, leading her team in batting average .407, 24 hits, three triples, 19 RBI's, and scoring 19 runs. Ley's current lifetime batting average sits at .403. Catcher for the lady rocks, Blair Bowers is our pick for most improved, considering the position and this being her first year behind the plate. Over the course of the season Bowers developed into a very good catcher a position very few players can play. Meagan Ley smokes a one bouncer over the fence for a ground rule double, batting in two runs. Madison Yarbrough did not see a lot of playing time, this being her only year playing softball. However Monday night she came alive, batting 1-2 with a double and four RBIs. Victoria Bowers was New Haven's right fielder and for the majority of the season was DH'd for, but Monday night she drew three walks, went 1-1 from the plate and scored four times. Madison Doyle's season ended not quite how she had hopped after suffer a concussion in last Thursday's win over Montgomery County. Doyle was the starting first baseman prior to her season ending injury. Doyle ends her softball career batting .225 on the year with one home run,(In the New Haven Softball Classic) which Coach Scheer said immediately after Doyle's homer, "I've been waiting the past three years to see that." It was hard to tell who was more excited, coach Scheer or Doyle. 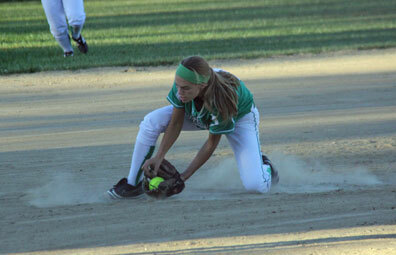 Carlie Steinbeck makes a tough play at shortstop. 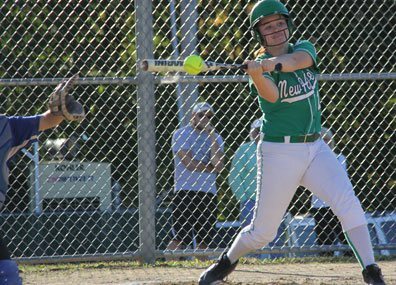 Steinbeck went 2-3 from the plate and recorded a career high 5 RBIs in New Haven's blowout win over Bourbon. Stephanie Scheer was New Haven's only pitcher, throwing all 21 regular season games and second in batting average .300. In Stephanie Scheer's three years of pitching, she started 59 games, recording a career total 106 strike outs in 334 innings. This year she held opponents to a .282 batting average in 112 batters she faced. While New Haven's season is not over as they face Wellsville in tonight's first round of districts, they will be losing five starters and their only pitcher. Like us on Facebook where you will find more photos that you can download for free. Click here to download the district bracket.